Spurred on by temperatures of 20 degrees plus in Northern Italy it was time to head directly south through Switzerland, a country we have cycled across before so had not planned to include this time. But it is a beautiful country, and well set up for the cyclist (even if they do take you up and over hills instead of on flat roads around them) so we were not too upset at this change. Other than the fact we had left our comprehensive Switzerland cycling guide, map and plug adapter at home. Lucky the routes are well signed. 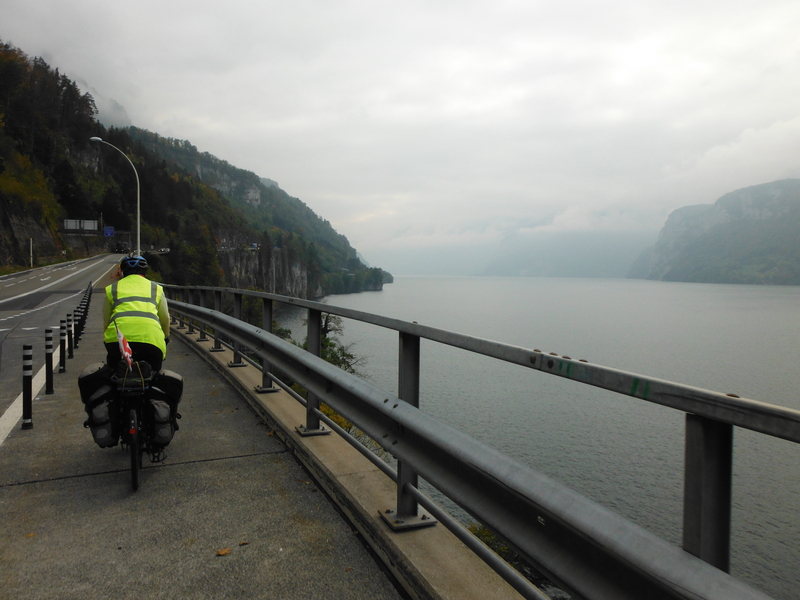 The first day in Switzerland was spent riding through the north of the country towards Zug, supposedly the most expensive city in one of the most expensive countries in the world. 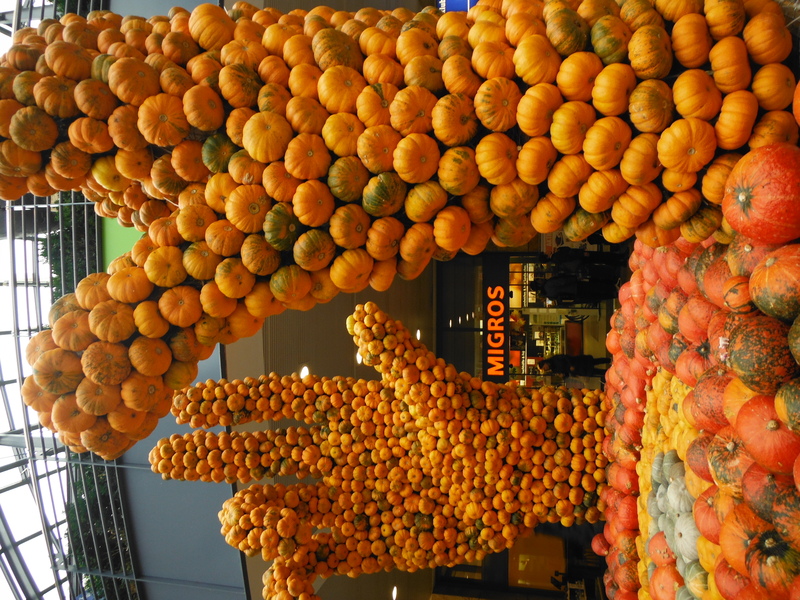 Our favourite thing about it was the obsession with pumpkins – we have seen a lot in the run up to Halloween but Zug took this to another level. From Zug we rode south mostly along lake shores, though the fog meant that they were a dull grey and the snowy mountains we knew lay ahead were obscured from view. Probably for the best. We made it as far as Wassen at 900m above sea level, negotiated a deal for a hotel room and fuelled up ready to climb to 2100m the following day. (For context, the highest mountain in the UK, Ben Nevis, is around 1300m high). We woke to a beautifully clear but frosty morning, finally able to view the mountains that lay in our path and the amount of snow up there. A 4km section of the road is being upgraded and we had been told that there is a bus service to take cyclists through the roadworks. After seeing no bus and no ‘road closed to cyclists’ signs we set off through the first tunnel with temporary traffic lights. The workmen laughed and encouraged us to keep going – must be fine we thought. However at the second tunnel we were faced with a Swiss man controlling the traffic rather than lights, who (we think) explained that we can’t cycle on and we should be on a bus. After arguing that there was no bus and no sign (in English obviously) we were finally waved on, and had to pedal madly uphill to try and get out of the tunnel before the traffic coming down was let through. With only gummie bears to fuel us this was difficult and after holding up a large truck we finally made it out. 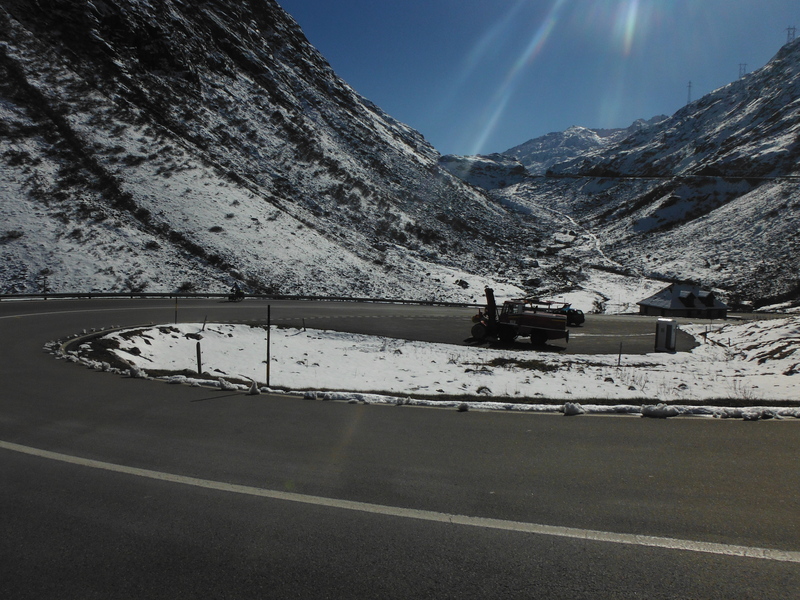 road flattens out towards the summit and before we knew it we had made it! 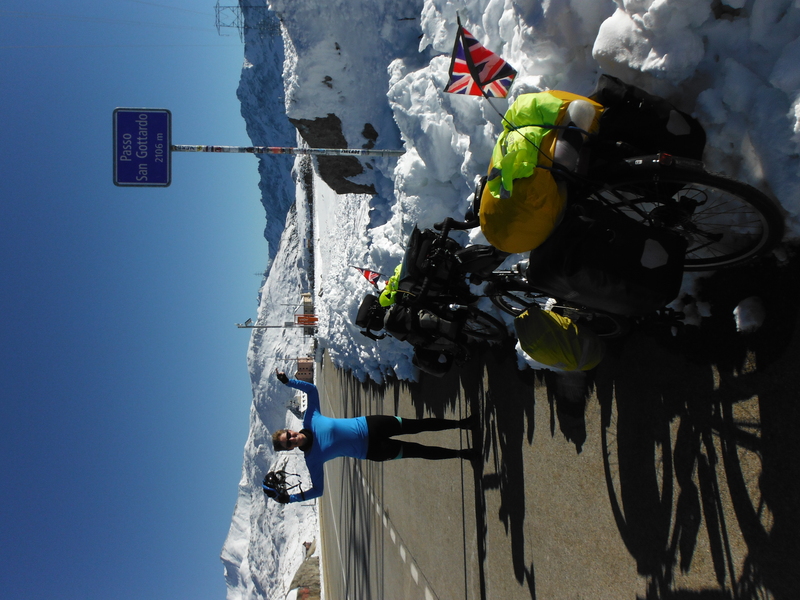 The snow was thigh deep at the side of the road and it was freezing cold, after a few celebratory pictures we put on several extra layers and set off on the descent, usually the reward for a tough climb but for us we had been dreading this due to the frost on the road. 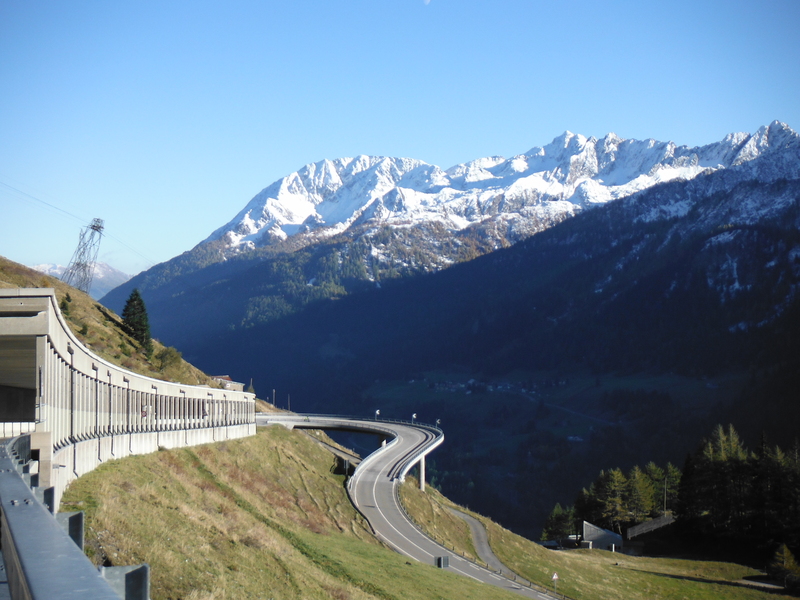 By the time we dropped to Airolo at 1100m through some steep switchbacks our hands and arms were more sore from being on the brakes than our legs were from the ride up. 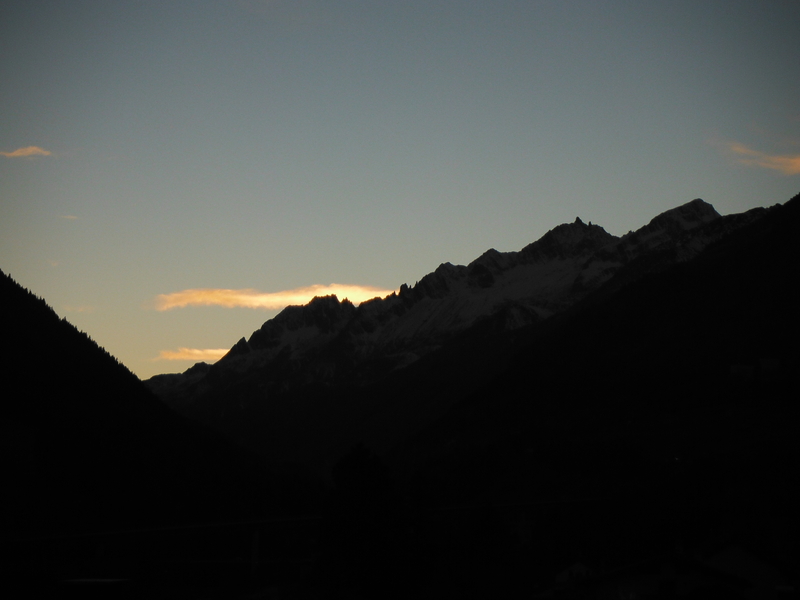 Again not wanting to camp we got a hotel room, extending our Swiss Alpine Holiday for one more night, and found we had a panoramic view of the Alps from the bedroom. Awesome! Looking up at the snow, where the road came from and how it twisted and turned we could not believe we had just cycled over the pass. All that was left was to have a celebratory dinner of pasta and tomato sauce (there are limits to our ‘holiday’) and collapse into bed very pleased with ourselves. Thanks to Ralf and Franzie and the staff at Hotel Gerig (Wassen) and Hotel Motto (Airolo) for making our Swiss Alpine Holiday just about affordable! ← Is it winter already? Well yes to be honest, maybe a little crazy! But that’s what makes us at home be able to read these incredible blogs. Don’t stop being I.C.E- No not in case of emergency, Intrepid Cycling Explorers!